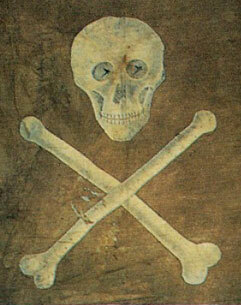 In the 17th century Caribbean, buccaneers fought under the national flag of their mother country. Sometimes, other flags were flown, designed to intimidate the enemy or as identification, often flown together with a national flag. Red was the preferred color for these flags, a color traditionally meaning "no quarter would be given." This meant that a fight to the death, and the defender's instant surrender was the only alternative. Some privateers captains devised personal banners on these red fields to add menance to the already fearsome image. For instance, Edward Cooke flew a red flag with a hand clutching a sword, and Christopher Moody used a skull and crossbones, a raised sword and a winged hourglass. 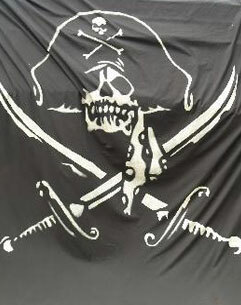 These later banners became known collectively as the "Jolly Roger," possibly derived from the French phrase "Jolie Rouge" (pretty red), an ironic reference to these piratical ensigns. 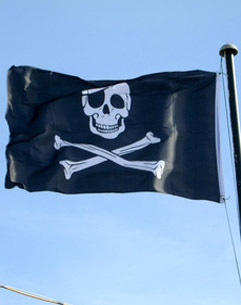 By 1750, many pirates used a black flag for their identifying standard and a red flag when going into battle. Symbols such as the skull and crossbones, or skeletons (representing imminent death) or hourglasses (meaning your time had run out) or weapons (a brutal fight) were widely used.